Arriving in Des Plaines, IL on January 5, they were welcomed by the Sisters of the Holy Family of Nazareth with dinner before departing for Cabrini Retreat Center, run by the Missionary Sisters of the Sacred Heart of Jesus, which would serve as their home base for the week. The students’ week included serving dinner to the homeless, packing meals at Feed My Starving Children, sharing time with elderly residents and sisters at Nazarethville, working at the Mission of Our Lady of the Angels in one of the poorest neighborhoods in Chicago, and visiting the Viator House of Hospitality to learn about the experiences of the asylum-seekers who live there. The week also included many opportunities for the students to share meals and prayer with our sisters while learning about Nazareth hospitality, spirituality and values. As their week concluded, the students gathered with sisters in the Provincialate Chapel for a Holy Hour and to share reflections about hope. Many of the students, returning for their second, third and fourth years, spoke of the peace and love they experience during each year’s visit with sisters. They spoke of the powerful simplicity of a smile and the light of hope they see shining among the sisters. Alison Celegoi, a senior at the college, said her time with CSFNs helped her to see the value of standing up for her faith. Love can open your eyes to our world. With Nazareth love and joy, the students’ eyes were opened to finding God in the everyday moments of our world. In addition to Alison and Robin, this year’s volunteers included Carla Aldana, Morgan Boyd, Nikki Hawk, Vicky Bajek, Celia Ibanez Pascual, Celine Elhajj, and Deacon Ed Horneman, chaperone. 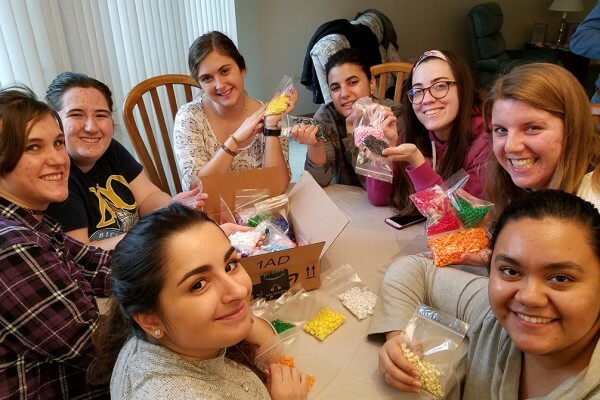 If you or someone you know would like to learn more about short- and long-term service opportunities with the Sisters of the Holy Family of Nazareth, please visit our Service Corps page.